The J-435™ hot tub was designed using a state of the art process for a modern interior that delivers a perfect fit for many body types and heights. The high-back design adds privacy and protection from the chilly outdoor air. The J-435™ is the perfect all-weather hot tub! 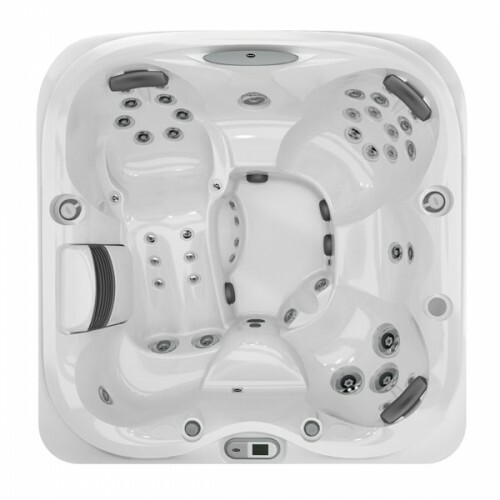 With a variety of seating options and top-of-the-line hydrotherapy, the J-435™ hot tub offers privacy, a forward-facing lounge and jetted cool down seat. The J-435™ hot tub was designed using state-of-the-art technology for a modern interior that delivers a perfect fit for several different body types and heights. The sleek high-back design adds privacy and protection from colder climates. 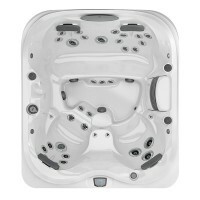 The J-435™ hot tub is available in all J-400™ Collection color, cover and cabinet combinations. This 7' x 7' model is the perfect all-weather hot tub. We are looking forward to seeing it in homes all around the world! Designed for comfort, this headrest easily adjusts to each bather’s preference, smart design drains water back into the spa. This is the same headrest introduced with the new J-445™.